This game is from the 1814 stable and was the first major engagement. It was precipitated by Napoleon deciding to engage a larger allied army and giving it a bloody nose before withdrawing from the field. This time I've added a map as I intend just talking about the pics. The French lines are from La Rothiere, then east and west in the villages and the lines of communication are to the north. The Allies are deployed in front of the French army. This turned out to be action all the way and the most dramatic of the medium sized battles fought so far and great fun. I'll leave people to look up the OBs themselves but the French are outnumbered. So they attacked!! This is looking from Dienville to La Rothiere. Apart from the villages, the terrain is very open. The French Young Guard, deployed on the right flank, launch themselves against the Allied left flank. This caught the Allies unaware and formations out of position and would hinder the Allies all battle. Looking from Dienville towards La Rothiere is the Reserve cavalry, primarily Dragoons. These brave men would execute countless charges to keep the Allies fixed in position to allow the right flank attack to gather momentum. This is the Allied left that faced the French Young Guard attack. The light cavalry would get hemmed in and by the time they extricated themselves the French Young Guard would fall on the infantry supporting them. Further along the Allied line towards La Rothiere. The French Cavalry Reserve would have to fend off these Divisions for the whole battle. It would be plain sailing for the French. This is from behind the Allied left. The French cavalry can be seen are trying to keep a distance from a concentration of Allied guns. These guns would ultimately cause heavy losses as the French cavalry would launch many charges. The Allied centre with La Rothiere just in view. This column is going to attempt to outflank La Rothiere to the left. The Allied cavalry to the top left would protect the flank of this advance. At the same time, Allied columns were advancing to the right of La Rothiere. A pincer movement was being executed with a screening in the centre of the village. Towards the Allied right flank, the French in the background are waiting to launch their own attack. The French are waiting to draw the Allies into committing themselves against La Gibrie. The Allies would not play ball forced the French to attack. The French use the cover of La Gibrie to prepare their own attack. The flank support, yet to be seen, would be the Guard Cavalry which was deployed between La Gibrie and La Rothiere. The French left flank to the right of La Gibrie. A powerful Allied battery would have to be engaged and silenced to allow this attack to work. This is the Allied right flank redeploying to face the attack from the French left. The powerful gun line is being constructed. The Allies were weak in cavalry in this sector, a lone regiment can be seen behind the gun line to the left of the pic. Viewed from the French line just left of La Rothiere, the Allied central attack against La Rothiere is sent in, in force. 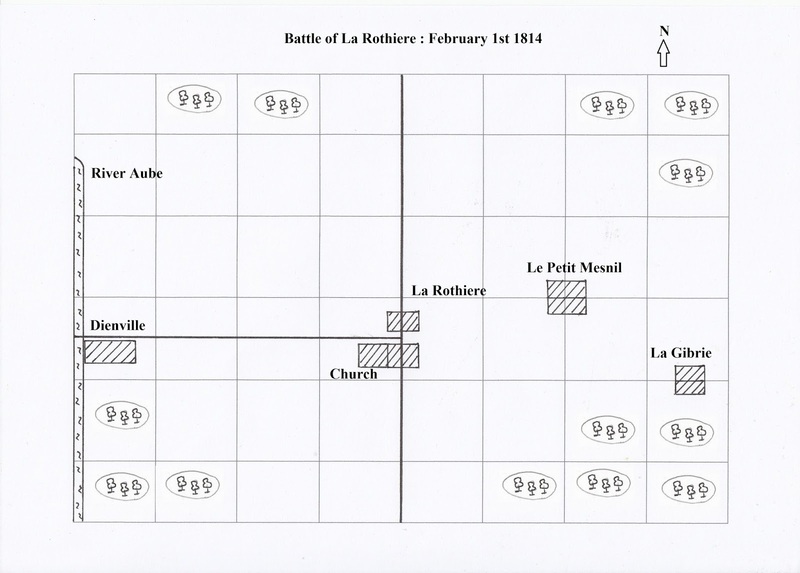 The French position was well covered and although the fight would last some time, the defenders would hold the day. The church, a significant defensive position, would repulse all assaults that numbered double digits. The French garrison deployed and prepared to defend against the assault of La Rothiere. Meanwhile, on the French right flank, the Young Guard are advancing and sweeping all before them. To aid this, the French Reserve cavalry has launched several cavalry charges against Allied guns lines and cavalry supports so that they cannot react to this French movement. The French cavalry reserve is committed en masse. The Dragoons are off table and now the lights are having to face Allied cavalry that outnumber them significantly. French horse artillery prepares to deploy to aid the cavalry. The rallied Dragoons now advance after the Allied cavalry were repulsed. All three regiments of this Division would assault the Russian gun line. Losses would be horrible!! Calmness is restored in La Rothiere as the Austrian assaults are eventually driven back. The Allied would not get a toe hold in the village. The Allied right wing advance to face the French attack from the left. It would halt when the French Guard cavalry advanced. The extreme right of the line would then come under intense pressure from French infantry. French infantry executing the left flank assault against the Allied right flank. Russian guns would wreak havoc for a while and the succumb to gradual losses and French charges. The Allies are trying to organise another assault to the right side of La Rothiere. The central repulsed column can be seen as it reorganises itself. Here you can see the French left flank assault, above the stick, descend upon the Allied right flank. The final assault against La Rothiere. The Austrians would give one final attempt, but the French would not yield an inch. 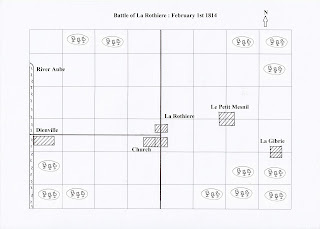 The outcome of the battle was decided on the flanks. The Allied left flank is now crumbling in a piecemeal fashion. Formations are trying to withdraw to escape the French Young Guard "grinding machine" as it inexorably continues to roll up the Allied line. Russian infantry fight bravely but suffer enormous casualties in trying to halt their retreat. The French Dragoons execute a last charge against a Russian square on the Allied hinge of their right. I can't remember what happened, but I'll have to make something up for the book!! The French at La Rothiere have gone over on to the offensive and finally drive the last Austrian assault away from the village. The fight in the centre is over. The French Young Guard, their victory complete, now drive on the Allied centre, the whole Allied right now withdrawing. The battle has come to a close. Rogues gallery, all regulars now. It was a great game with lots of surprises and a lot of intense fighting. It also again demonstrated how command & control affects these games when gamers cannot automatically do what they want to do. Frustrating but more realistic! The next game will be a biggy, Eylau. New snow rules to try out! And finally, the first "Companion" book to the rules is at the publisher Caliver ready to print. It covers the 1809 Danube campaign and also discusses some rule aspects of "In the Grandest Manner".